This side scan sonar data is then converted into images and then processed to be as uniform as possible with previous years. In 2016, the team began by extracting regions of interest through traditional image processing techniques. These regions were then fed into a convolutional neural network (CNN) that worked to identify the likelihood the regions contained shipwrecks. Since networks are best trained on large sets of data, the small amount of available data poses a serious problem. In 2016 the team used a process called transfer learning, wherein one uses a network that has been trained on another dataset and has been optimized to extract features. The specific network used was the ResNet network, one that is trained on a enormous database of images for the purpose classifying the ImageNet database, which contains roughly 20,000 different categories of images. The output of the CNN was then fed into a support vector machine (SVM) to classify images into three categories: definitely containing a wreck, possibly containing a wreck, and not containing a wreck. By comparing the classification with that done by an expert in the field, Dr. Timmy Gambin at the University of Malta, they were able to discern how successful their network was. In 2018, the team began a slightly different approach, creating and tuning a different neural network architecture and artificially creating new data for the model to train on by distorting the existing training images. By shearing, scaling, and translating the images, the team was able to create artificial data upon which to train which would actually help the network identify wrecks. 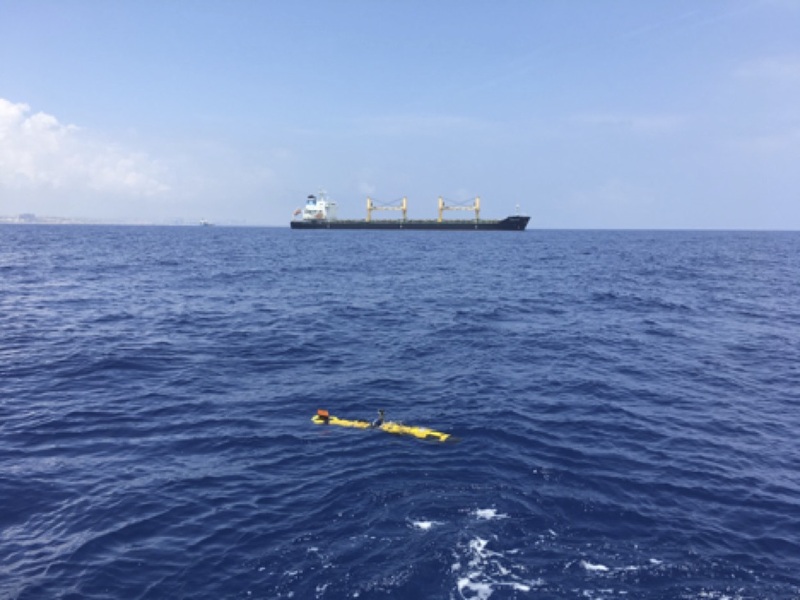 Not only does this process provide a larger training and validation set, it would help the network identify wrecks even if they were distorted by various phenomena that occur fairly frequently in the side scan sonar. Previous years’ data had a strong decay in pixel intensity as a function of distance from the central vertical axis of the image. The team normalized this data from in order to more closely match recent years so that it could be used to train and validate the network. The team decided to forgo using traditional image processing techniques to identify regions of interest, but rather to chop the overall image into 200px by 200px squares and feed those into the neural network. This would hopefully prevent any wrecks from being missed by traditional techniques and not making it to the network. In addition, the team manually extracted various features, including edges, corners, and large contour orientation and size into the network right before it reached its classification stage. The belief motivating this decision was that by providing features which humans use to identify wrecks, the network would have a better chance of correctly identifying which regions contain wrecks and which do not.